Even the Water Fountains in Paris Are Beautiful! Although it’s been cool in Paris for mid-June, the temperatures will rise eventually. And when they do, everyone will need more water. So, what will you do for a cool (free) drink while exploring, shopping, walking the (thirsty) dog, or out for a run? Here’s an idea: head for the nearest Wallace fountain. 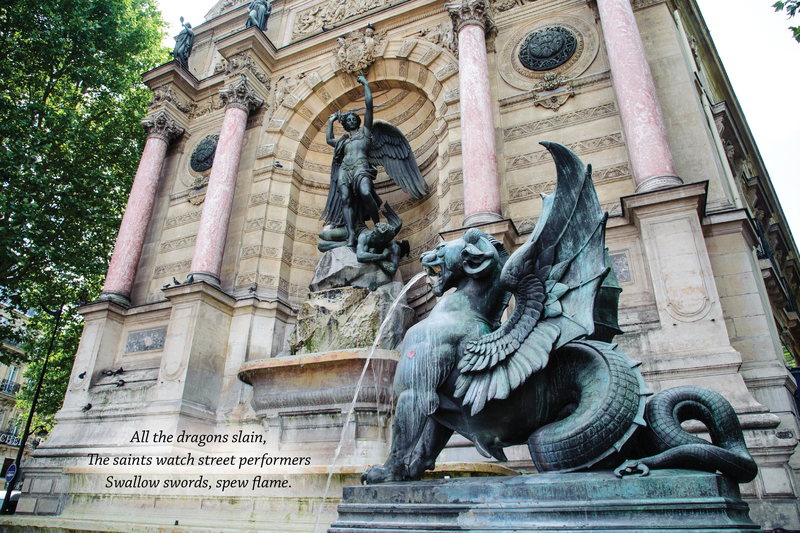 You’ll find them all over the city, Sir Richard Wallace’s namesake cast iron fountains. These veritable Paris icons, designed by Charles-Auguste Lebourg, were installed in the 1870s out of concern for both hygiene and access to affordable, potable water for everyone, including the homeless. Their installation was initially financed by the wealthy, English philanthropist, Sir Richard Wallace. He called Paris home for many years, and is buried in Père Lachaise Cemetery. The most recognizable model (shown below) is tall, with an ornate dome-like top, supported by four lithe ladies in draped clothing, called “caryatids.” Not goddesses, but more like muses, the four caryatids represent Kindness, Simplicity, Charity and Sobriety. The water is fresh, potable, cold. Fill up, slurp, and splash! In days gone by, pewter cups hung on chains to aid in taking a gulp. They were removed in 1952 as more hygienic sensibilities took hold. It’s common now to see thirsty-types “going green” by refilling their reusable water bottles or canteens. Most (but not all!) 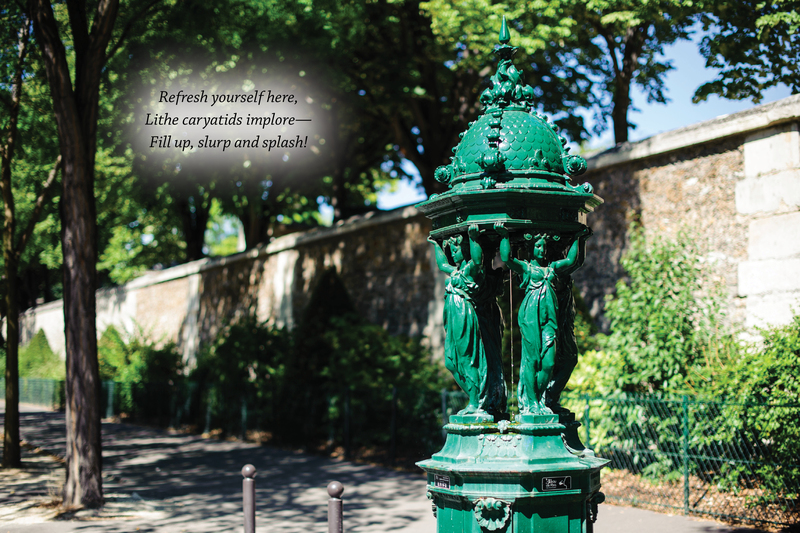 of the Wallace fountains are painted the same dark green chosen by Napoleon III to provide unity for ubiquitous, repetitive urban installations (such as benches, lampposts, kiosks, Morris columns, water fountains, etc.). They also have decorative details with aquatic themes: dolphins, fish, shells, tridents. Look more closely, next time! 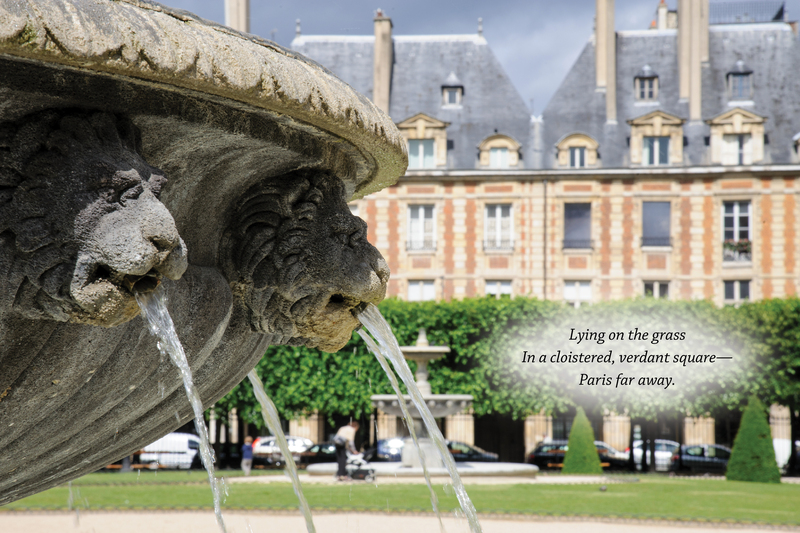 Do you enjoy discovering esoteric little gems in the cities you travel to? Ever wonder how millions of urban dwellers almost miraculously receive millions of gallons of fresh water to their taps everyday? I recommend the little Pavillon de l’Eau exhibit space operated by the Paris water department. You’ve already seen the sewers! Although the exhibits are in French, the excellent graphics (photography, charts, diagrams), displays and models tell their stories well even without words—from ancient Gallo-Roman times to the present, this is where and how Paris gets its water. 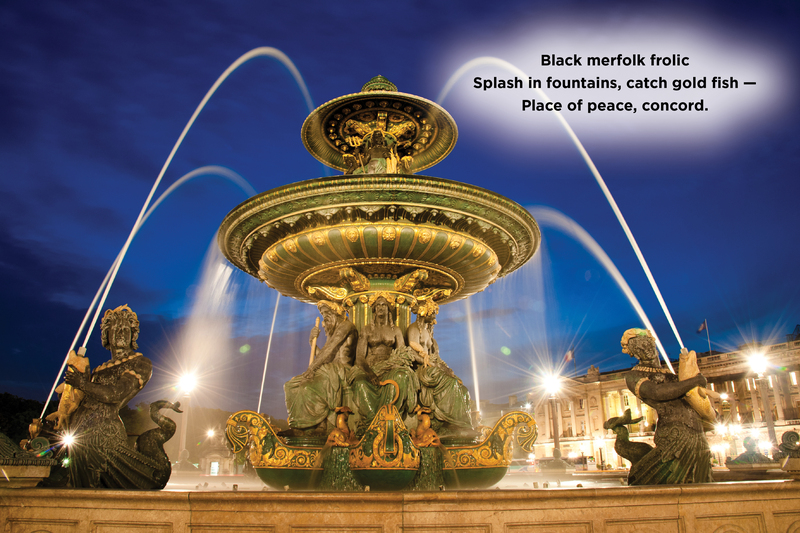 The catalog of the 2012-13 exhibit on Paris’s fountains is here for viewing and downloading; pages 19-21 feature the Wallace fountains’ history; a map of their placement around the city is on pages 4-5.